Well, my secret's out - I'm a glasses wearing geek. When I was younger, I used to be so desperate for glasses that I'd sit with my face ten inches from the tv screen whilst wearing clear lens glasses from Claires. Then, at twelve, I got my wish. Only then, when it was too late, did I realise WEARING GLASSES ISN'T ACTUALLY THAT FUN. Now, at 21, I'm blind as a mole and, after failing to recognise my own Mother in a restaurant, I realised it was time to kit myself out with a pair of glasses that weren't too embarrassing to wear outside of my flat. Enter MyOptique, who were kind enough to send me over a pair of their London Retro sunglasses. They're the perfect frame shape and they also come with scratch-resistant and anti-reflective lenses, so my little mole eyes are having a pretty good time. I also decided to join the trainer club this week. If you follow me on Twitter, you may have noticed that it's recently turned into a series of foot-updates. First, there were blisters. Then my gradation shoes cut all my heel. And then, well, then a blister started growing on top of an already existent blister. Me and my feet looked at each other and nodded in mutual agreement: it was time to get some comfy shoes. 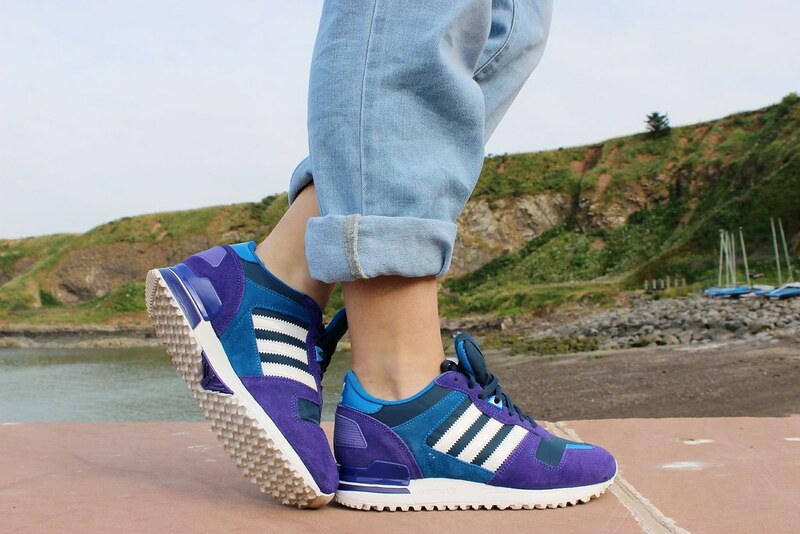 So when the lovely Jade from Bank got in touch, I knew exactly where I was headed, and picked out these amazing Adidas babies along with some sweet freakin' dungees to go with them. I picked up some basic tees in the New Look sale last week which have been great under my dungarees. Actually, they've been great with everything... long live the basic. Love this look and the glasses look great on you! Blimey I must have the same feet issues as you! My graduation shoes gave me blisters and I swear my converse are wrecking my feet a bit more each day. CUTIE PATOOTEY!! Love your outfit, keepin' it caaaaaajjj with those dungaz and tip toppedy sneakz! You can pull annnything off, please can we swap faces/wardrobes/etc? Please? Thank you! AH-MAZING. Love this outfit, favourite one yet girl! 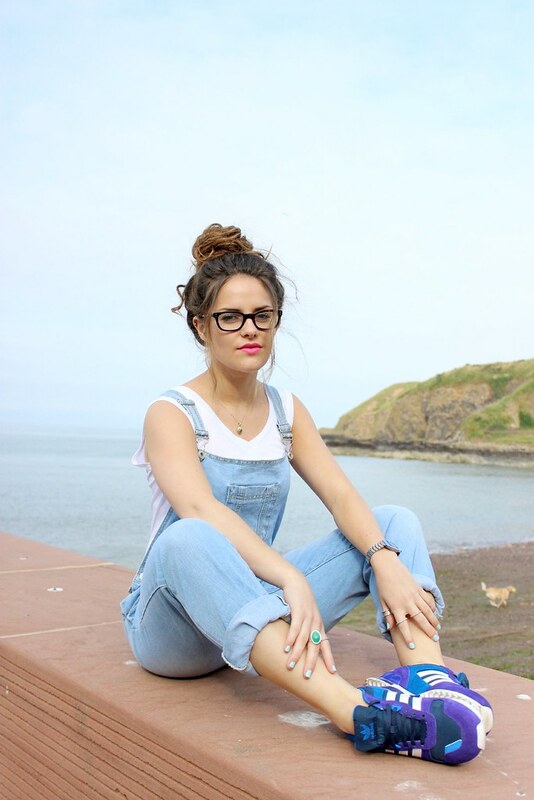 Those dungarees are beyond perfect and a big yes to the trainers. Woo go glasses club! 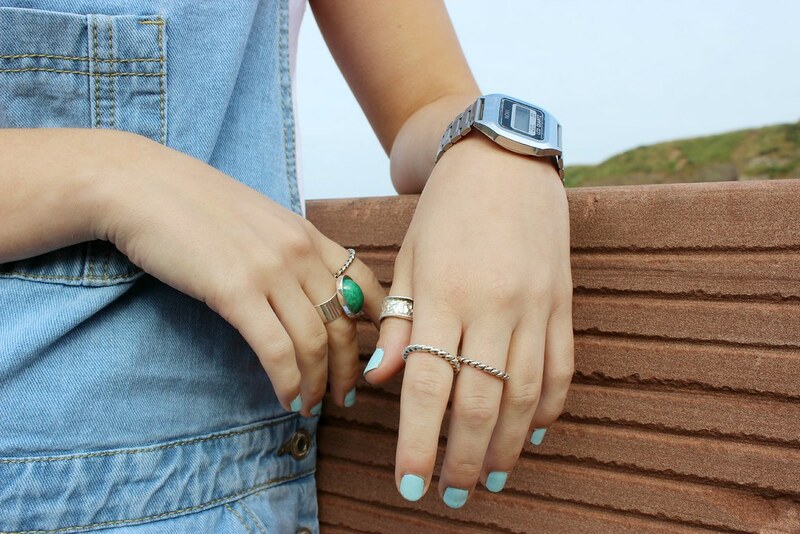 Those dungarees are lovely! Also, that lip colour really suits you too! :) I agree with the 'long live the basic' principle A LOT haha. I used to long for glasses too and used to wear my friends all the time. Now I need them I lose then constantly! Totally with you on the blind front... my optomotrist is actually fearful I may go blind :o hopefully not anytime soon as I'm only 19! 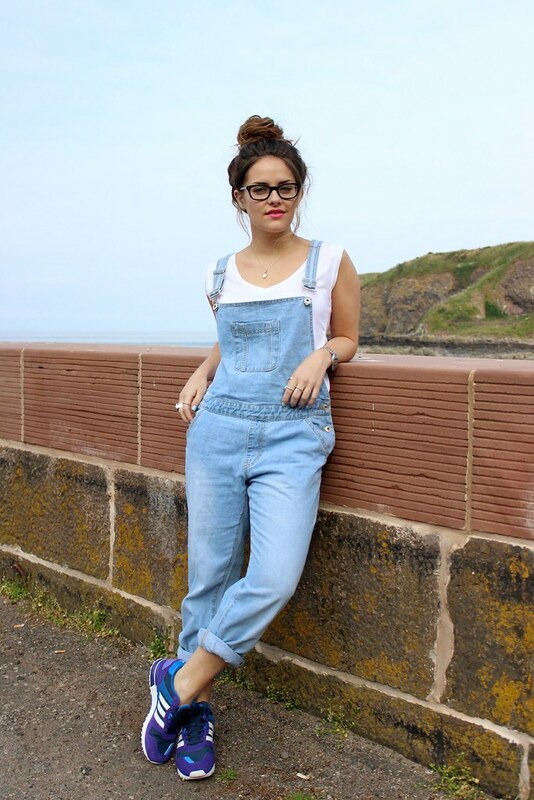 Love, love, love the dungaree-trainer combo. Looks great! I'm experiencing death by blisters at the moment too... ridiculously mine didn't appear during my weekend of standing up and dancing about at Latitude, but decided to form on a 10 minute walk to the supermarket. Ridiculous. love these dungarees, the last photo really made me laugh! and I've worn glasses my whole life, it really isn't fun being young and blind as a bat! Haha! Love this, my dad took my bro to the opticians when I was younger and sadly for my dad's budget he took me along. Even though I had no issues with seeing, I pretty much threw the biggest tantrum ever for him to get me these mickey mouse glasses I took a liking to, they were prescription only! I wore them for about 2 days. So, I understand your 12 year old self trying sacrificing eyesight in the name of fashion! you look freaking amaazing, those trainers, oh mama! LOVE this look, it's so adorable! so jelous that you can pull off this look!! love your blog, you are a slice of fabulous awesome delight.